Do you want to make your favorite ice cream more interesting so your food business customers can be further enticed? Why not fry it? Here’s a simple recipe to make fried ice cream. <>We rarely find and eat fried desserts. But for sure, when we try one, we can’t easily forget the bizarre gastronomic experience. 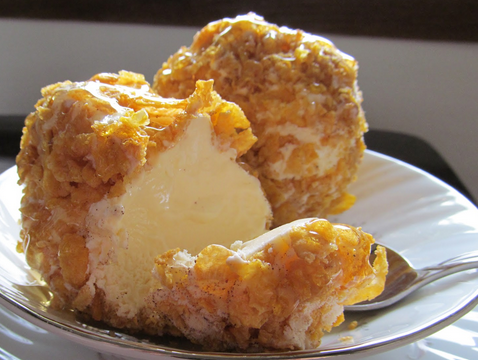 Have you heard about fried ice cream? Yes, it is possible to fry your favorite frozen dessert to make it not just more interesting but also more appetizing. Fried ice cream is not actually a new food concept. It was invented in 1894 in Philadelphia in the US, although some historical accounts claim that it was first served in 1893 during the Chicago World Fair. Here in the Philippines, it is also not a new concept but it is something that is rarely offered in restaurants and food joints. You may want to try putting up a small home-based food business offering fried ice cream as one of your pride desserts. Here’s a simple recipe you can follow. 1. Line your baking sheet with waxed paper. 2. Put a big scoop of ice cream into the baking sheet. Make more scoops. Be sure all of those are uniform in size. 3. To make the ice cream firmer prior to frying, place the baking sheet with the scooped ice cream into the freezer. Leave it there for about an hour or two or until the ice cream gets firmer. 4. As you wait for the ice cream to get firmer, crush your corn flakes or puffed rice. This could be as simple as putting it into a small plastic bag (sealed) and using a rolling pin to crush it. 5. Put the crushed corn flakes into a bowl and add your flaked coconut (optional). Add cinnamon or sugar (also optional). 6. Beat the eggs in a bowl. Add a tablespoon of milk. Continue beating to mix thoroughly. 7. Remove the ice cream scoops from the freezer. Roll each into the cornflake mixture. Create ice cream balls. 8. Roll each ice cream ball into the beaten egg and milk mixture. 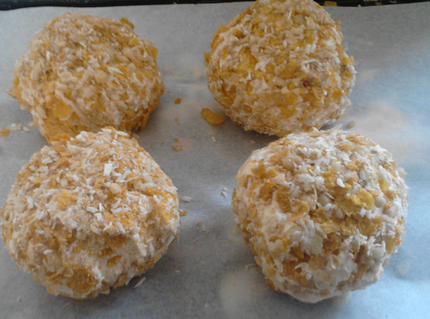 Then, roll all of them into the cornflake mixture once again. 9. Return each ice cream ball into the baking sheet used earlier and put into the freezer again for about an hour.